Submitted by SayUncle (not verified) on Mon, 2005-02-14 13:53. For the record, I'm not Libertarian Girl. Submitted by BUSH LIED! (not verified) on Mon, 2005-02-14 13:45. Nevertheless, the deal between the Department of Defense and Halliburton unit Kellogg, Brown & Root brings about the theocrat Ashcroft's suspension of our civil rights. Since the collapse of the Soviet Union, the influence of Leo Strauss leads our attention to a humanitarian disaster of unimaginable scale. It is not heartening that the pro-Sharon neoconservative cabal belies justifications given by the world's leading apologists for an act of international violence that exceeds even those of the "liberal" Bill Clinton. Perhaps for the first time since the late 1940s, Bush’s argument for war can be seen in the light of the apparent fabrications which lead to the result of a pre-fascist atmosphere in America. Submitted by The Agitator (not verified) on Mon, 2005-02-14 13:21. And TheAgitator.com is actually outsourced to an eigh-year old Vietmanamese girl. Submitted by SayUncle : More accusations (not verified) on Tue, 1999-11-30 00:00. Submitted by Mark J (not verified) on Mon, 2005-02-14 12:05. It's "Hot Abercrombie Chick" all over again, except this guy is embracing his outing instead of continuing to lie about it. Submitted by Stephan (not verified) on Mon, 2005-02-14 08:56. To all you desperate libertarian guys who agreed with and/or made arguments in favour of LG's idiotic breast tax nonsense just cause you wanted to be agreeble with a pretty libertarian girl, I have only to say..........For shame. Submitted by Eternal Recurrence (not verified) on Mon, 2005-02-14 06:57. Submitted by Wizbang (not verified) on Mon, 2005-02-14 06:51. Submitted by CoolParty.us &raquo; So-Called Libertarian Girl &#8216;outed (not verified) on Tue, 1999-11-30 00:00. Submitted by The MUSC Tiger (not verified) on Tue, 2005-02-15 23:04. In light of current blogosphere events exposed by Catallarchy, I have added a new author to The MUSC Tiger. Read more about our new "Wild" author. Look for her to provide intriguing commentary on all things travel. Submitted by Wazoo (not verified) on Tue, 2005-02-15 23:12. Mr. Ex-Libertarian Girl claims the person on the new photo on his blog is "[n]ot the real me, but closer to the real me than the last picture". Whatever the case may be, further investigative work by yours truly has revealed that the person on the new photo is called "Dave Saindon" (a.k.a. 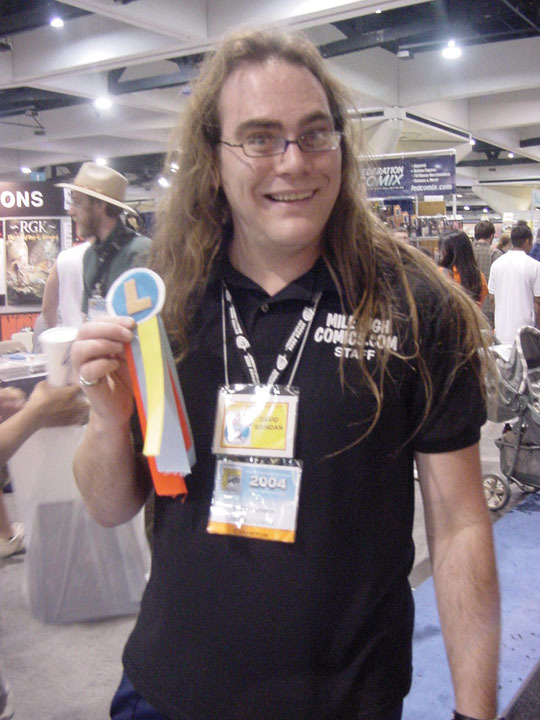 "Squirrel"), who is the Manager of the "Mile High Comics" store in Lakewood, Colorado. Dave holding a way cool 1950's psychodelic Jemez vase. God, I have too much time on my hands. Submitted by Micha Ghertner (not verified) on Tue, 2005-02-15 23:16. Damn, Wazoo, we should hire you as our resident research dude. Submitted by Wazoo (not verified) on Wed, 2005-02-16 00:11. On the other hand, it is more probable that he may simply have been searching for a picture of some 30-something loser, beacuse that photo is on the first page of a Google image search for the word "loser". Submitted by Micha Ghertner (not verified) on Wed, 2005-02-16 00:15. How did you reverse image search these two pictures? Tell us your secret! Submitted by Blog Jones (not verified) on Wed, 2005-02-16 00:19. In a recent post, I linked to a blog called Libertarian Girl, mainly to quote a commenter named austroblogger. I don't plan on linking to her much more, because I found out via InstaPundit that she is a he. Submitted by The Fly Bottle (not verified) on Wed, 2005-02-16 01:49. Submitted by Deltoid (not verified) on Wed, 2005-02-16 02:14. Submitted by justin (not verified) on Wed, 2005-02-16 15:48. People actually accused me of planting the profile on match.com. The difference with the HAC hoax was all the other evidence pointing to Daniel Zeigenbein that Cameron and I had previously uncovered. Submitted by DCist (not verified) on Thu, 2005-02-17 13:55. Submitted by AKRONPUNDIT (not verified) on Sat, 2005-02-19 13:21. A while back, a blogger blogging as Libertarian Girl, turned out to be a middle-aged guy. Photo evidence popped up here. Submitted by DCist (not verified) on Sun, 2005-02-27 18:01. Submitted by Michelle Malkin (not verified) on Mon, 2005-03-07 17:05. Submitted by Stand Up and Walk (not verified) on Sun, 2005-03-20 15:01. Submitted by Catallarchy &raquo; You&#8217;re Invited&#8230; (not verified) on Tue, 1999-11-30 00:00. Submitted by Scott Berman (not verified) on Fri, 2005-06-10 21:38. Submitted by Jennifer Schulz (not verified) on Tue, 2005-09-20 01:24. Submitted by The Agitator (not verified) on Tue, 2005-10-18 17:58. Is Kelo a Victory for Federalism?